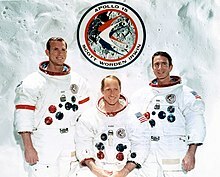 Apollo 15 wis the nint manned mission in the Unitit States' Apollo program, the fowert tae laund on the Muin, an the aicht successfu manned mission. ↑ Orloff, Richard W. (September 2004) [First published 2000]. "Table of Contents". Apollo by the Numbers: A Statistical Reference. NASA History Division, Office of Policy and Plans. NASA History Series. Washington, D.C.: NASA. ISBN 0-16-050631-X. LCCN 00061677. NASA SP-2000-4029. Archived frae the oreeginal on August 23, 2007. Retrieved July 18, 2009. This page wis last eeditit on 8 Dizember 2015, at 17:58.